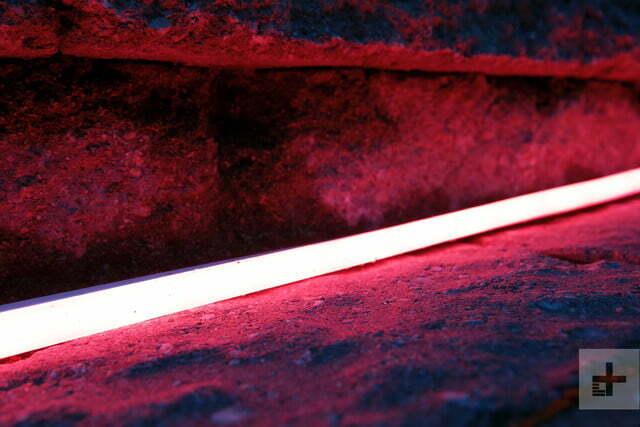 Philips Hue’s Lightstrip Outdoor offers rich colors and is a versatile addition to your home’s lighting scheme. Fans of Philips Hue smart lighting have been waiting for years to see the company develop a robust, weatherproof range for the outdoors. This year, the company has stepped up with a new range of lighting for outdoor spaces, including Lucca wall washers, Lily spotlights, Calla pathway lamps and, at last, an outdoor LED light strip, simply named Lightstrip Outdoor. In fact, budding outdoor designers can pick from not one, but two new variants. 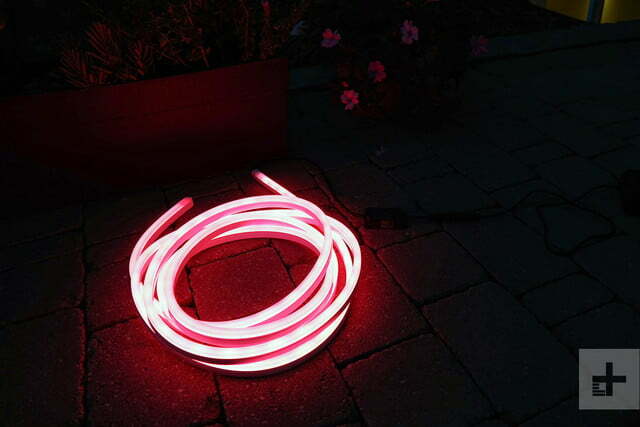 An entry level, $90 light strip measures 80 inches (two meters) while those requiring a longer run can invest $160 in a 197-inch (five meters) strip. The latter is certainly pricey, but owners with growing collections of Hue lamps will know that story all too well. 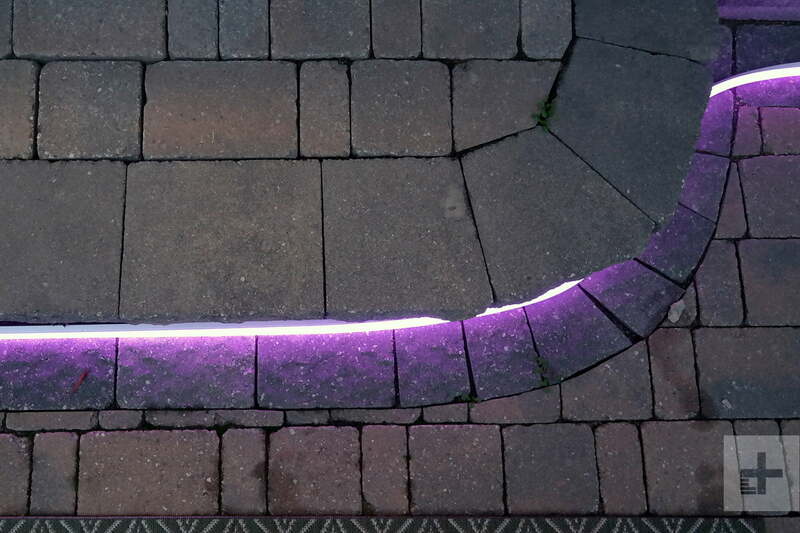 While some lines in the Philips Hue range include beautifully crafted luminaires with graceful lines and flowing curves, the Lightstrip Outdoor offers a more functional aesthetic. Indeed, the bright white and frosted silicone cladding that surrounds the LEDs is quite drab, meaning you’ll most likely want to hide it away, so it’s invisible in the daytime. It’ll stand up to the elements in all but the harshest climates. The strip can be simply placed in a free-standing position, although its long length and the fact it cannot be cut to size may push owners to use the U-shaped clips supplied in the box. Once screwed into your deck, wall, ceiling, or other fixture, you’ll find the strip clips tightly into place – a neat option, but one that requires some thought ahead of installation. Rated IP67, the light strip is robust enough to be submerged in water for a short time, although we wouldn’t recommend it. Protection from water jets (think garden sprinklers and power washers) and rain is a more relevant expectation. With operating temperatures between -4 and 113 Fahrenheit (-20 to 45 Celsius), it’ll stand up to the elements in all but the harshest climates. 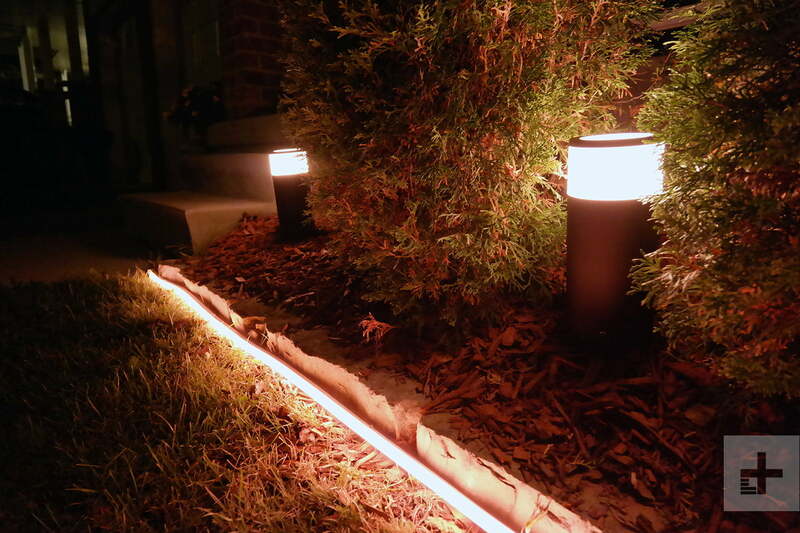 Fully sealed, individual LEDs cannot be replaced, but a promised lifetime of 25,000 hours should provide many evenings of back yard illumination and assistance with any holiday lighting. 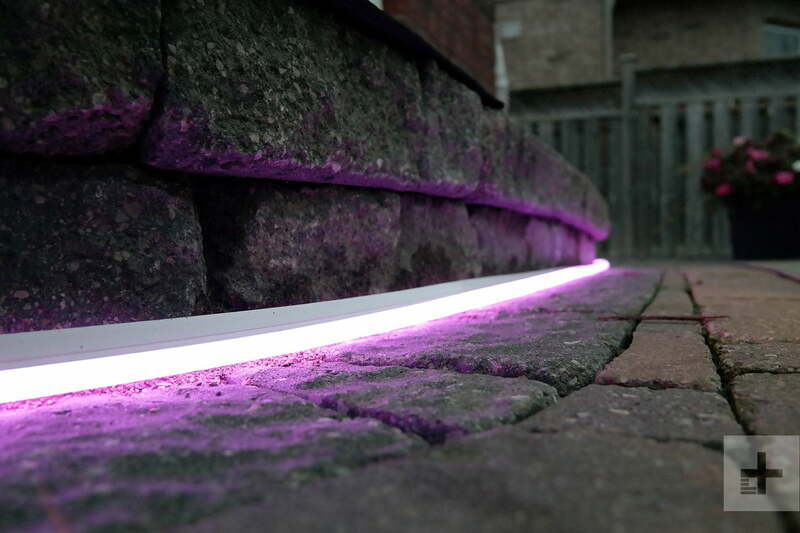 Once you’ve figured out your deck or garden lighting scheme, you’ll be pleased to find that installing the light strip is a straightforward job. Like all Philips Hue lights, you will need an existing Hue Bridge ($60 or available in Starter Kits from $70) to connect the ZigBee-controlled LEDs to your smartphone. With that in place, hook up the included power supply to a weatherproof outlet and you’ll see the strip illuminate immediately. Just a few steps with the Philips Hue app (iOS/Android supported) allows you to find and connect your light strip to the Bridge, assign a “room,” and you’re good to go. Any required firmware updates for your lights are invisibly downloaded and installed in the background, so you can jump straight in and check out colors and effects available in the app. You’ll enjoy playing with example color schemes and a wealth of custom controls. We’ve discussed the simple and friendly Philips Hue app in several recent reviews, so we’ll spare some repetition here (but if you’re new to Hue, be sure to check them out). We will reiterate that the app makes basic light control a cinch. Packed with features, you’ll enjoy playing with example color schemes and a wealth of custom controls to enliven holidays, parties, and barbecues, or add a relaxing vibe to a summer’s eve. More advanced smart home owners will love seamless connectivity with any Amazon Alexa or Google Assistant-enabled device, and there’s a plethora of IFTTT recipes and Hue Labs formulas for the adventurous. Once installed, you can’t help but be impressed at Hue Lightstrip Outdoor’s illumination, which offers a full 16-million color range, with temperatures between 2,000 and 6,500K. Color rendering is accurate, with clear blues and greens alongside glowing reds and oranges, and you can choose from a range of adjustable whites, from cool to warm. With dimmable output from 740 all the way up to 900 lumens, brightness is not an issue. You’ll find the upper reaches to offer more than enough illumination for garden pathways, and it’s a simple job to adjust the light for other locations. 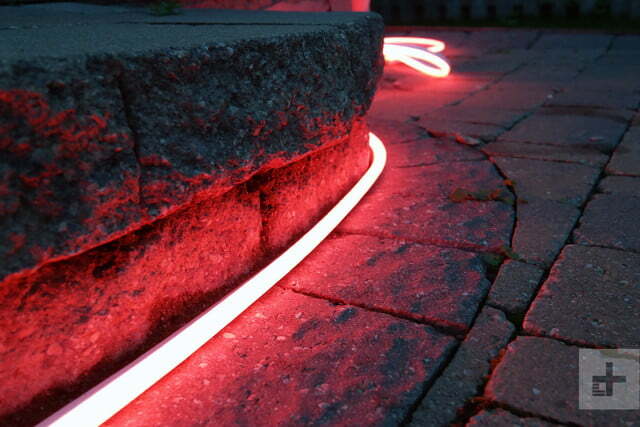 Regardless of how you choose to take advantage of Hue Lightstrip Outdoor’s rich colors and fantastic array of features, you’ll find it to be a versatile addition to your lighting scheme. Philips Hue Lightstrip Outdoor is backed by a two-year product warranty. Philips Hue fans have salivated over the prospect of an outdoor light strip for more than six years, and now it’s here. 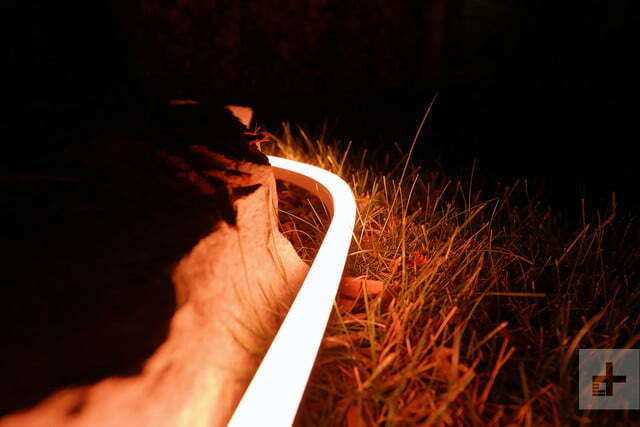 Thankfully, Hue Lightstrip Outdoor lives up to its billing with simple installation, a rich selection of features, and brilliant illumination. It’s sure to delight garden lovers everywhere. High-quality, consumer-grade garden illumination is thin on the ground, so it’s great to see Philips extend the Hue range outdoors. As a cheaper alternative, check out the SYLVANIA Smart+ range (branded as OSRAM LIGHTIFY in some countries), which includes outdoor RGB LEDs, but lacks Hue sophisticated array of features and integrations. As a leader in illumination for over many years, Philips Hue is a de facto choice for smart home lighting. The company regularly improves its offering with features, fixes and firmware updates, while the system works with a host of third-party devices and services. Outdoor lighting is new to the range and comes with unique challenges, but you can invest with confidence. Yes. 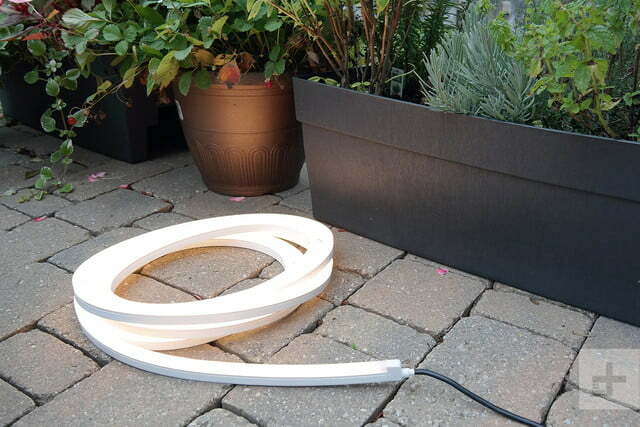 If you decide that your garden or deck could use a refresh or you need a boost in holiday lighting, Philips Hue Lightstrip Outdoor may offer a simpler, more cost effective approach than a full do-over.